The United States Cabinet (usually simplified as "the Cabinet") is composed of the most senior appointed officers of the executive branch of the federal government of the United States, and its existence dates back to the first American President (George Washington), who appointed a Cabinet of four people (Secretary of State, Thomas Jefferson; Secretary of the Treasury, Alexander Hamilton; Secretary of War, Henry Knox; and Attorney General, Edmund Randolph) to advise and assist him in his duties. 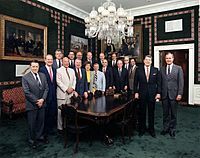 Cabinet officers are nominated by the President and then presented to the United States Senate for confirmation or rejection by a simple majority. If approved, they are sworn in and begin their duties. Aside from the Attorney General, and previously, the Postmaster General, they all receive the title Secretary. United States Cabinet Facts for Kids. Kiddle Encyclopedia.